Angels in the Realms of Heaven: The Reality of Angelic Ministry Today is the third book in the exciting, real-life, supernatural series, Dancing with Angels! If you are intrigued by what Heaven looks like and what God’s angels are doing today – you will love this book. Heaven and angels are described in detail by someone who has been there numerous times. 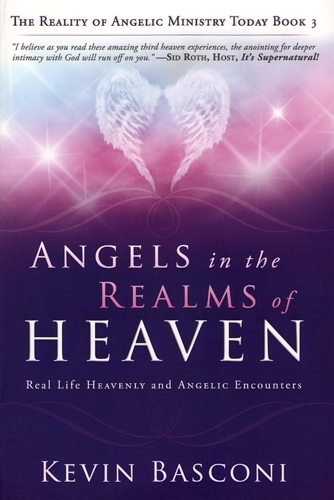 Unlike other books that are basically Bible studies about angels, Angels in the Realms of Heaven is full of testimonies of actual present-day angelic encounters and visitations. “The Lord told me to record my supernatural experiences, and they are shared in this book. I hope these simple testimonies about Heaven will inspire in every reader a sense of their heavenly home,” writes author Kevin Basconi. You will be moved to tears of joy and hope as you experience Angels in the Realms of Heaven for yourself! When Kevin Basconi had his encounters with angels and visited the heavenly realms, it transformed his life and drew him into the secret place of intimacy. I believe as you read these amazing third heaven experiences, the anointing for deeper intimacy with God will rub off on you. Sid Roth, Host, It’s Supernatural! Kevin is the real deal. He has almost daily encounters with heaven and the angelic and sees unusual miracles as a result on the earth. Kevin will take you on a journey that will open your eyes to the realm of heaven like you have never known before. “On earth as it is in heaven” will take on a whole new literal meaning as you read this book. You will also discover an entire host of angels waiting to minister with you and accelerate everything you are called to do as your intimacy with God explodes into new levels you never knew existed. Kevin Basconi’s trilogy is full of insight, revelation, and records of fascinating encounters he has had with angels and the supernatural realm of the Kingdom of God. 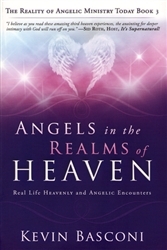 In his third book in the Dancing with Angels series, Angels in the Realms of Heaven, he vividly shares the duties and activities of God’s angels in their specific assignments in Heaven. You will read detailed accounts of Kevin’s heavenly experiences in the past ten years in addition to descriptions of various terrains in the Father’s domain. The reality of Heaven will be awakened in you as you read this book. Kevin and Kathy Basconi are ordinary people who love an extraordinary God. They cofounded King of Glory Ministries International. They have a heart to share the gospel with the poor and the love of the Father to widows and orphans. They have visited 30 nations preaching the gospel and demonstrating the Kingdom of God in churches, conferences, and crusade meetings. They live in the mountains of North Carolina, where they pursue a lifestyle of intimacy with Jesus. Kevin is an ordained minister accredited with World Ministry Fellowship of Plano, Texas.